The effects of the Swiss National Bank’s decision to abandon their EURCHF currency floor last week continued to reverberate across markets overnight with Denmark’s Nationalbank unexpectedly reducing their deposit rate by an additional 15bps to -0.2%. The decision, following an unscheduled policy meeting, comes before the ECB policy meeting on Thursday where the bank is widely expected to begin outright sovereign bond purchases. The OECD released their third quarter employment situation report overnight with the group revealing an increase in employment throughout the economic bloc of 0.1% to 65.7%. While now 0.5% higher than the levels of a year ago the ratio still sits some 0.8ppts below the pre-crisis peak of 66.5% struck in Q2 2008. While an overall improvement was recorded the level for Australia held steady at 71.6% for a third-consecutive quarter. 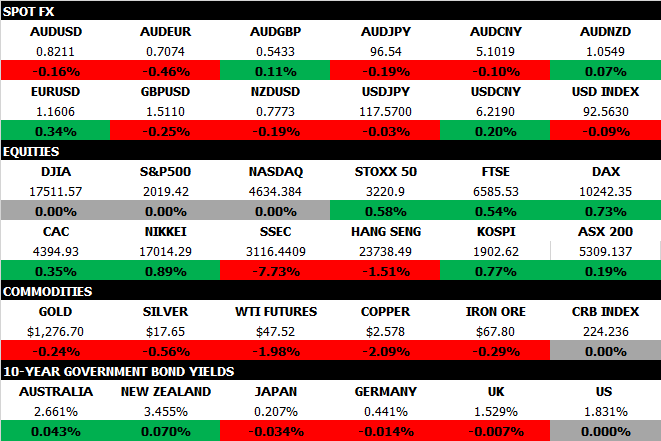 Speculation over ECB quantitative easing and Greek elections this Sunday will temporarily take a back seat today as markets await the release of major Chinese data later in the session. SPI futures point to a decline of 5pts on the open, something that is probably reflective of investor caution before this market-moving event. While movements in Chinese equities will once again be influential, they recorded their largest one-day percentage decline since June 2008 yesterday, given the data will either show the economy is tracking ahead of expectation or likely in need of additional stimulus measures from the PBoC, it will be interesting to see whether the Australian market will push higher no matter what the outcome this afternoon. As a general rule of thumb the GDP figure will be most influential with monthly industrial production data also a market-mover. An uneventful session for the AUDUSD overnight in the absence of US traders with the pair operating in a thin range between .8197 to .8243 throughout. As is the case with equities the release of Chinese GDP, along with a raft of monthly metrics, will likely drive the movements in the pair today. Should the data come in ahead of expectation, particularly the GDP print, expect the pair to test selling resistance above the .8250 level. On the flipside, should the data be net-weak, look for the Aussie to fall back to buying support layered from .8170 through to .8130. Still, with market faith in central bank stimulus remaining strong, any such dip will likely me be momentary in nature. Chinese Q4 GDP, along with industrial production, retail sales and urban fixed-asset investment figures for December, will be released today. GDP is expected to grow 1.7% on quarter, down from 1.9% in Q3, with the annual rate tipped to slow to 7.2% from 7.3%. Elsewhere industrial production is forecast to grow 7.4% on year, up from 7.2% in November, with retail sales and fixed-asset investment expected to remain at 11.7% and 15.8% respectively. All releases are scheduled for 1pm AEDT. Earlier in the session markets will also receive the latest NZIER business confidence survey from New Zealand. US President Barack Obama will deliver his State of the Union address at 1pm this afternoon. Data releases this evening include the NAHB homebuilder confidence survey from the States, PPI and ZEW investor confidence from Germany, Italian international trade along with Russian GDP.